Searching for pictures online is a fairly simple task. We go to Google.com, click on Images and then type in the keywords of whatever picture it is that we want to look for.But I think that when it comes to image-searching woes, we all have the same issue. What’s that two towers thingy in London that look identical and has a bridge thingy in between? Now you wouldn’t go and type “the two towers thingy in London that look identical and has a bridge thingy in between.” You’d probably just sit there and stare and try to rack your brain up for pointless hours, thinking what in the world those two towers are called. Or you could simply type in “London” and then let Google do the work for you. Yeap that’s right. Just when you think Google has made everything else in life easier for you, they have come up with something that… makes everything else in life a LOT more easier for you, thanks to Google Images with sorting. 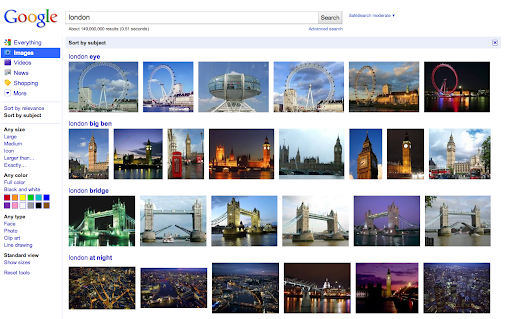 So you type in “London” and by default you will see image results that are ranked by relevance. And then here’s the part where life seems more simple – you click on “Sort by subject” in the left-hand panel and Google will arrange these images into categories that will help narrow down your search and find whatever it is those twin towers are called. The images shown and sorted are some of the most popular ones associated with London, such as the London Eye, Big Ben, and the Tower Bridge. Bingo – the Tower Bridge! Not only do you get to see that picture you were looking for, but you finally know what it’s called. And then you can click on the Tower Bridge group to find the best picture of the bridge. Well what are you waiting for? Go try it out! I just did and it’s pretty cool!